Roll BioMat onto a flat surface. Place gold paisley pattern side down, amethyst side up. If you also purchased a Quantum Energy Pad, place it next to your BioMat; then place your quilted cover pad on top. Insert the connector of the temperature control into the BioMat. Plug the unit into an electrical wall outlet. Activate the rocker switch on the control panel (located on the right-hand side). The green light will come on. Press “Power” on/off button and press temperature “up” button to highest setting to warm up the mat for 20 minutes. When ready to lie down, the suggested time is 20-30 minutes on low to medium heat and build in 5- to 10-minute increments each day, gradually increasing the heat, as you wish. Be sure to ARISE SLOWLY. REMEMBER to drink lots of water before and after each BioMat session. Insert the electrical plug into the wall outlet. Press the “Power” button and the green “on” light will illuminate. Press the “Temp Up” button so that it goes up to the highest setting and allow the MiniMat to warm for 20-25 minutes. Suggested usage in the beginning is 30-45 minutes, low or medium temperature. You can increase the temperature and time in 10- to 15-minutes per day. Note: If the temperature on the control box is set for 122° F. or higher, after four hours the controller will automatically decrease the temperature to 113° F.
You may also wish to set the timer for 2-, 4-, 8- or 12-hours. It will automatically turn off after the pre-set hours. Get up slowly from using the BioMat and remember to drink water both before and after using the BioMat. The BioMat is a powerful healing tool and a detox. If you use it too long and with too high heat, you may feel nauseous, queasy, icky! There’s no need for this … slow and steady wins the race!! 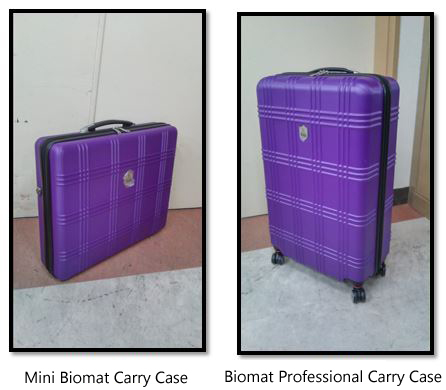 Be sure the BioMat is completely cool before rolling it up and placing it in the suitcase. The amethyst should be folded to the inside (the gold paisley pattern side design will be visible in the suitcase). To launder the cotton cover, use unscented, chemical-free laundry detergent and no dryer sheets.